The benefits of plant-based eating for cancer survivors, and easy steps patients and their families can take to eat healthy, is the focus of a special cooking demonstration offered by nutrition science and dietetics students. Falk College, in collaboration with the Upstate University Cancer Center’s certified specialist in oncology nutrition, presents “Purposeful Plant-based Eating for Cancer Survivors and Cancer Risk Reduction: A Recipe Demonstration and Tasting,” on Wednesday, March 9, at 6 p.m., in the Nutrition ACE Center, 204 Falk College. The program was developed in Falk College’s “Food Demonstrations: A-Z” course, taught by Professor Tanya Horacek, that helps students develop nutrition education skills for working with a variety of audiences. The event, which is intended for cancer survivors, patients and their family members and those who are interested in cancer prevention, is free and open to the public. Attendees will watch recipes being made and taste four to five different plant-based recipes. Research indicates that maintaining a healthy weight, staying physically active throughout life and consuming a healthy diet can substantially reduce a person’s lifetime risk of developing cancer. Says Horacek, “Whether you are trying to prevent cancer or you are a survivor, food can be medicine. By combining various plant-based foods you can extract the beneficial effects of the nutrients and phytonutrients.” For cancer survivors, the recipes are tailored for the typical side effects that might be experienced. 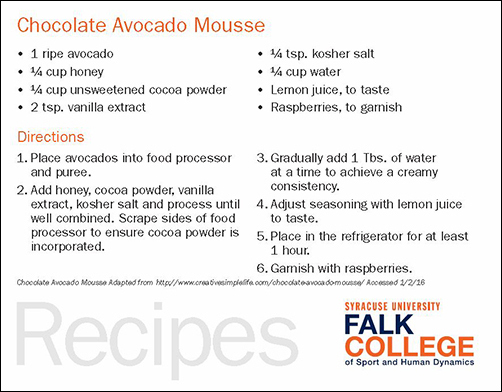 In September 2015, Falk College opened its Nutrition Assessment, Consultation and Education (ACE) Center, a new hands-on learning laboratory to prepare students with traditional and emerging professional competencies critical to effective nutrition practice. The purposefully outfitted demonstration kitchen supports Falk College’s new integrative nutrition curriculum, which uses food as medicine to support disease treatment. “Syracuse University, thanks to support from our generous donor, Rhoda Dearman Morrisroe, has created a center that simulates the types of professional settings where its graduates will work while providing ongoing, unique learning opportunities that give students a competitive advantage. This dedicated space provides an ideal environment for educational community partnerships that benefit students and our local neighbors,” says Falk College dean, Diane Lyden Murphy. To register for the event, contact Donna Sparkes at 443-5573 or djsparke@syr.edu. Registration deadline is Friday, March 4. Space is limited to the first 40 people. World Cup Begins, But Will We Watch?